Ulani was so agitated this evening. At one point I made her go outside and I heard the neighbor (over 1/4 mile away) hollering, so I thought that might be the issue. Then when the barking didn't stop, I made her come inside and do a sit- stay next to me while I watched tv. She held that for a while, then got all riled up again. So I sent her outside with Oskar. They ran to the back fence and barked and barked. I peeked out to see what they were barking at. her to chase it to the fence and snap its neck. I immediately went inside to get a bag, knowing she would not eat it, just poke it in hopes that the chase game could be continued. inventory I realized it was the stripey chick. She'd grown large enough I thought she was one of the adults, but that's the one that's gone. How'd she end up in the dog yard? In the past few days the Godzilla Hen has chased her chicks away when it's time to roost. She wanted them to find their own space. I noticed that they were trying out different places each night in an attempt to find somewhere comfy and safe. Tonight the white hen was roosting right above the gate into the coop -- and there's about a six inch open space between the gate and the crossbar where she sat. 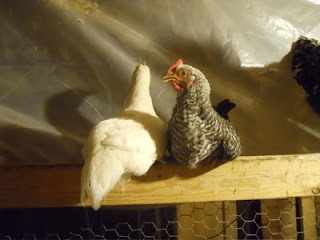 I imagine both chicks were there, then the one for whatever reason hopped down into the open barn. Why it went over the Dutch door into the yard is anyone's guess. The chickens are never allowed there, for obvious reasons. I can't be mad at Ulani, she was only doing what her instincts demand of her. But I'm sad that the chick never got to grow up. Sorry about your chicken. I lose a two day old chick when the other hens killed it this weekend. I rescued the other two and put them in a brooder box.